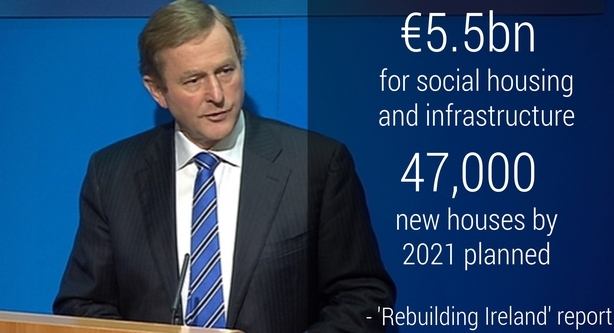 The Government has published its housing and homelessness plan entitled 'Rebuilding Ireland'. 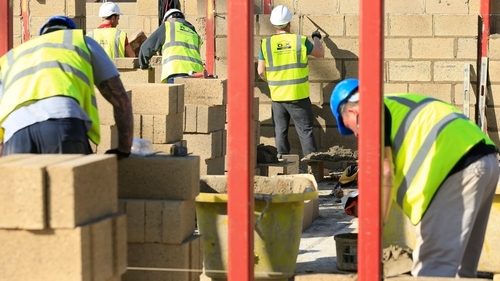 The 114-page document aims to accelerate all types of housing supply and provide 47,000 new social houses over the next six years as well as targeting an annual overall build of 25,000 units per year. The plan targets homelessness and aims to ensure that by this time next year hotels are used for families in only limited circumstances. There will be extra help for those with mental health and addiction issues as well as supports for the rental sector and greater use of empty units. The lack of homes and homelessness was described as a national crisis by all political parties earlier this year. The plan, which was approved by Cabinet this morning, is the Government's response to that crisis. First-time buyers will have to wait until the Budget in October to hear the exact details of what Government is proposing to help them buy a home. However, Minister for Housing Simon Coveney has said that any changes in Budget 2017 for first-time buyers will be back-dated to today. Launching the document, Taoiseach Enda Kenny said the Government was honouring the promise in its Programme for Government. The plan would need the commitment of the entire sector and the real involvement of local government, he added. Mr Kenny said the economic turmoil of the recent past meant we were not building sufficient houses, some people were struggling to afford a mortgage, and others were being made homeless through no fault of their own. Mr Kenny paid tribute to Minister Simon Coveney and thanked the committee's approach, saying the plan sets out a clear road map. He said €5.5 billion will be available for social housing and infrastructure and that the plan will help private housing infrastructure and build on the private rental market. The drafting of the plan has been a collaborative process and successful implementation will rely on all involved, the Taoiseach said, adding that there will be no task the Government will undertake that will have such a direct impact on people's lives. Minister Coveney said the Government was determined to change dramatically the State's response to those who found themselves homeless. The Rapid Build programme target would be trebled, and vacant properties would be utilised, he said. In the short-term, there would be nutrition and dietary initiatives for homeless families in short-term accommodation. There would be health supports for the sector with the budget for dealing with homeless people with health issues trebled to €6 million. On social housing, he said the biggest new idea was creating mixed developments of social and private housing using publicly-owned land banks. That would create diverse and vibrant communities while at the same time tackling the stigma attached to social housing, he added. Mr Coveney said the planning system would change to encourage suitable new builds in the right places. 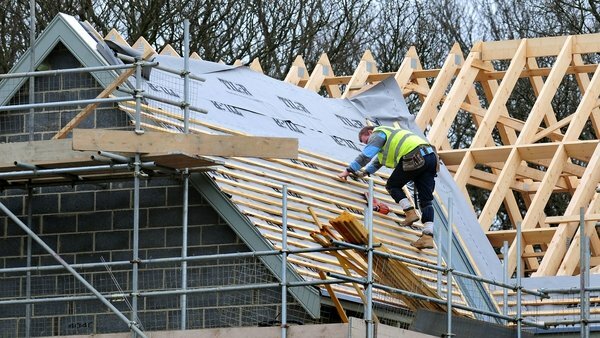 Developers would be able to go direct to An Bord Pleanála with plans for estates of over 100 houses and Government would put pressure on the Bord to approve suitable projects in a timely manner, the minister added. National Trust charity An Taisce has said there are "a number of unnecessary proposed changes to planning laws and procedures" contained within the plan. It said An Bord Pleanála already has a procedure to speed-up applications and that there is "no evidence that An Bord Pleanála is holding up development". "Furthermore, a high proportion of appeals to the Board are developers appealing against local authority financial contributions. Expecting the Board to determine new applications within and 18 week period does not address the high level of issues for provision of further information that are likely to arise." It also said there is no shortage of zoned land with full planning permission and therefore there is no need for further extension of permission for "developments already granted an extension of time". In the Dáil, Fianna Fáil leader Micheál Martin questioned the capacity of the Government to deliver the scale of social housing needed to meet the current need, given the small amount built to date. He asked the Taoiseach to consider setting up a separate statutory agency to deliver on the housing plan. Children had been living in hotels for the last three years, a true blight on society, he added. Mr Kenny said the issue of providing proper accommodation for the homeless is a key priority, with 47,000 houses being provided by 2021. He acknowledged the execution of the plan was the important point. The plan was costed and timelined and would be overseen by the Cabinet sub-committee on housing, he added. Fianna Fáil spokesperson on housing Barry Cowen welcomed the plan, describing it as "good in parts" but "disappointing" in others. He said the Government had "long-fingered" issues in the rental sector and the difficulties facing first time buyers and students. Mr Cowen said that Fianna Fáil would continue to push for the introduction of a grant scheme for first time buyers. He also said that a stand-alone national procurement agency was needed to address the housing crisis. Mr Cowen said the action plan was incomplete, with several "gaps that needed to be filled". He said Fianna Fáil would make proposals to address those failings. If the Government was unable to tackle the crisis adequately, he said that a new Government would eventually need to be formed. Sinn Féin's Eoin Ó Broin criticised the housing plan saying it is "nowhere near good enough". He accused the Government of not taking the housing crisis seriously enough. Mr Ó Broin said that while the plan would result in more social housing units, he said it would be nowhere near enough to meet demand. He said reform of the private rental sector had been "kicked into the touch of autumn".